The team at Grabowski Orthodontics are passionate about helping make great smiles. Meet the Grabowski team! Dr. Kenneth Grabowski Orthodontics understands that you have a variety of options for orthodontic care. Feeling comfortable and understanding the care you will receive is an important part of the selection process. Whether you are still in the investigation phase or already a Grabowski patient, we hope these FAQs help you on your orthodontic journey. Need more information? Contact us today or call us at 269-323-0212. An orthodontist is a dental specialist who has received 2 to 3 years of additional training and experience after dental school. An orthodontist is able to straighten teeth, correct misaligned jaw structure, and improve the function of your smile. If you want to improve the look and feel of your smile, then any age can be a great age to see the orthodontist! The American Association of Orthodontists recommends that children first visit an orthodontist around the age of 7; however, orthodontic treatment is not exclusive to children and teens as approximately 20 percent of orthodontic patients are over the age of 21. Whether you’re considering treatment for yourself, or for a child, any time is a good time to visit the orthodontist. If you take out your retainer to eat, brush your teeth, and floss, then remember to keep it safe in its container so that it does not get lost or broken. Keep your retainer clean as well by brushing it gently with a toothbrush and toothpaste. You may also use denture cleaner twice a week. Do not use hot, boiling water, or the dishwasher. During your treatment, try to avoid foods with a lot of sugar since sugar increases the amount of bacteria that grows in your mouth causing more plaque and possibly cavities. It is advised that you eliminate or significantly reduce pop and sugar drinks while in braces. The combination of acidity and sugar is extremely harmful to enamel and can leave unsightly and costly decalcification scars on the teeth. Avoid sticky and chewy foods (caramel, chewing gum, gummy bears), hard foods (hard candy, nuts, ice cubes), or any foods that could possibly get stuck in your braces (corn on the cob, soft bagels, ribs, taffy, etc). Be sure to schedule your routine checkups with your family dentist. It is recommended that you continue to visit the dentist every six months. Some people may benefit from a three-month cleaning interval from their dentist it they are unable to provide adequate home care. The amount of time spent in braces can vary depending on the individual patient. Every smile responds differently to treatment. Treatment times can take between 12 to 30 months; however, with SureSmile™ technology an average treatment time is reduced more than 30 percent. This approach can eliminate months of traditional treatment time. The placement and adjustment of braces does not cause significant discomfort, but often the day after adjustments the teeth can become sensitive or sore to biting procedures. You’ll discover your favorite soft foods! Advil or Tylenol can be taken as needed. By the third day after an adjustment, the sensitivity is usually decreased to a normal level. With braces, you should brush your teeth at least three times a day to keep your teeth, gums, and mouth healthy and clean. Brushing regularly will help remove any food and plaque that may be caught between the braces. You should also floss daily to get in between your braces where your brush isn’t able to reach. Your orthodontist can show you how to properly brush and floss once your braces are placed. Yes! In fact, it’s even more important that patients receiving orthodontic treatment visit their dentist regularly. With braces, food may be caught in places that are more difficult for your toothbrush to reach. This feeds the plaque or bacteria that builds up and can lead to cavities, gingivitis, and gum disease. Your dentist will work closely with your orthodontist to make sure that your teeth stay clean and healthy while wearing braces. Simply call our practice! 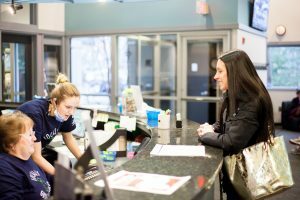 Our front desk staff will be happy to help schedule your next appointment at your convenience. We also provide a service through ortho sesame that allows you to check your appointments online amongst other services. If you are a new patient or have been referred to our practice, please let us know, and we will provide you with all of the information you need. We look forward to helping you create the beautiful, one-of-a-kind smile you’ve been waiting for! Contact us today for more information or request an appointment. Dr. Kenneth Grabowski Orthodontics is, in my opinion, the best center for one to get their teeth aligned. The entire staff is very professional, polite, and make going to the orthodontist fun. Now that I am getting my braces off, I can’t wait to see my new smile!